I know you probably don't know if you're Arthur or Martha when you swing by this blog...one day it's retro interiors, the next treasures I've found in the oppies, and today, inspired by the Pipstars post (here), I've got my craft-thing on. 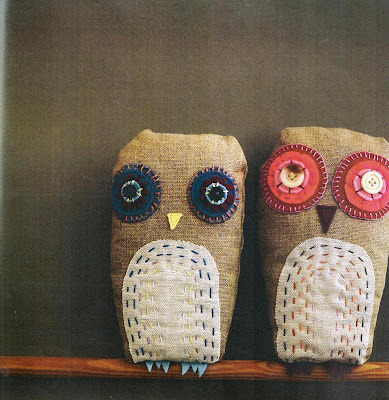 My Owly is based on these sweet owlies designed by Heidi Iverson. Pippa also said "everyone needs an owl friend" I hope so. he'd wink, if he could. If you'd like to make a softie for the Mirabel kids too, go for it! Click the link up top, or this one for more info. You can't really go wrong with an owl. Imagine the hugs it will get. You are a Jack of alll trades it seems! Your owl is adorable! It's going to make someone very happy. Kylie, it is gorgeous and such a wonderful cause. Someone special is going to LOVE it! Lordy but you've been prolific this month Kylie! Owly is fab. Now I need to scroll back and see everything else I've missed. Lovely sewing Kylie. Such a sweet little owl. i don't mean this in a bad way!